Hi. I'm Michael Spencer. I believe that the movies created over the last hundred and twenty years are some of the great treasures of the world. The first film I remember ever seeing was Walt Disney's Pinocchio and – I cannot tell a lie – I was hooked. I started making films with a home camera in elementary school (back when that was unusual). My first grown-up film was Helium!, a film studying the life of a once-happy balloon gone bad. This short-feature sendup of The Red Balloon was chosen to represent the changing face of independent film at the Foundation for Independent Video and Film. I went on to study film at New York University and UCLA and since then have written and produced a number of award-winning programs for cable and broadcast television. Subjects cover topics as diverse as martial arts to the art of the cocktail, from the frontiers of modern medicine to the culture of tourism. 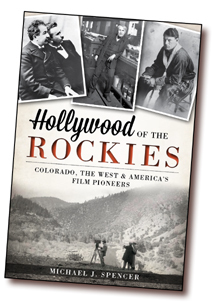 Hollywood of the Rockies is an expansion of the CINE Golden Eagle Award-winning documentary of the same name that I produced with Rocky Mountain PBS. You can see some of my film and video work at ThisIsMichaelSpencer.com.